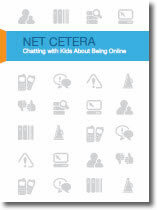 Net Cetera:Chatting with Kids About Being Online covers what parents need to know, where to go for more information, and issues to raise with kids about living their lives online. Your kids' personal information and privacy are valuable - to you, to them, and to marketers. Fortunately, there are ways you can safeguard that privacy when your kids are online. Ask questions. If you're not clear on a site's practices or policies, ask about them. Be selective with your permission. In many cases, websites need your okay before they're allowed to collect personal information from your kids. NetSmartz411 - A parents' and guardians' premier, online resource for answering question about Internet safety, computers, and the Web. NetSmartz.org - Internet safety resources from the National Center for Missing and Exploited Children. Cyberbullying Advice for Parents - Cyberbullying Advice for Parents from InternetSafety.com & the Cyberbullying Research Center. Growing Up Online – PBS Frontline - Just how radically is the Internet transforming the experience of childhood? A Parents' Guide to Facebook Designed to help you understand what Facebook is and how to use it safely.